On the same day that the Chevrolet Corvette Stingray was named North American Car of the Year at the Detroit auto show, GM unveiled a different version with 170 more horsepower. The Corvette Z06 will have a 6.2-liter supercharged V8 producing at least 625 horsepower. The Corvette brand represents a small part of General Motors' overall sales and the Z06 will be just a sliver. But the Corvette is an important "halo car" for GM. It represents the pinnacle of the carmaker's engineering capabilities. More importantly, although it may not sell in big numbers, interest in the Corvette draws potential customers into Chevrolet showrooms. The last-generation Z06, which went out of production after the 2013 model year, had a 505 horsepower engine and a base price of $75,600. This new Z06 has nearly as much horsepower as the last-generation Corvette ZR1 which had a price tag starting at over $100,000. 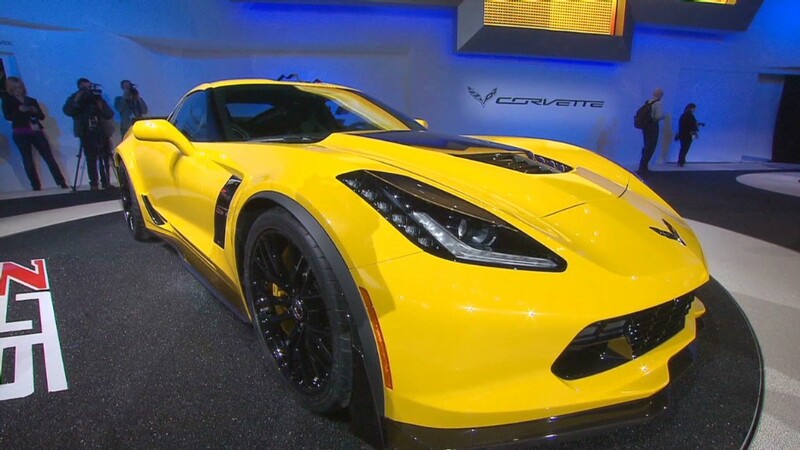 Pricing for the new Z06 will be announced closer to start of production in early 2015, GM said. One reason GM (GM) produced the new Z06 was to meet racing regulations for the new C7.R race car, which was also revealed at the show. The C7.R competes in endurance races which have rules requiring that a car be closely related to ones sold to customers for street use. The Z06 is the more powerful of the two cars. Besides all that horsepower, the Z06 also has 635 foot-pounds of torque, a crucial figure because it's a measure of the engine's pulling power. It creates the acceleration you feel when you step on the gas pedal. By comparison, the last-generation ZR1 had 604 foot-pounds. The Z06 will be offered with a choice of either a seven-speed manual transmission or a new high-performance 8-speed automatic transmission. As in the base Corvette, the automatic transmission will have shift paddles mounted on the steering wheel, giving the driver the opportunity to select gears manually. The Z06 has a wider fender than the base Corvette Stingray to accommodate the Z06's larger wheels. The front wheels are 1.5 inches wider and the back 2 inches wider. The Z06 also has bigger air vents to provide more cooling air for the the engine, brakes and transmission. The new Z06 also has a more rigid body design, which improves handling but has an added benefit. Unlike the last Z06, this one will be offered with a removable roof panel for open-air driving. The C7.R race car will make its track debut on January 25 at the Daytona International Speedway.